"I have always regarded my thangka’s bigger than myself"
I started studying thangka painting in 2008 with Andy Weber, a renowned Western thangka painter. Although all my images are entirely painted digitally, they follow centuries old rules, measurements and colour schemes. Since I take great care in using the correct iconography, you can use them in visualization meditation and your daily Buddhist practice. Of course they can also be enjoyed as the beautiful art pieces they are. Last year my income consisted mostly of some unemployment benefit, supplemented by my patrons’ support and an occasional donation (by the way: thanks for that, you all rock!). So it is time for a new approach and I urgently need more people to get involved in Digital Thangka painting! I have done some calculations and for a bare minimum of living, I need 364 patrons more, (based on a monthly pledge of $1 or 182 with $2 etc., you catch my drift). Starting last week of September 2018, I will released more of my digital thangkas as a free download. Every first day of the next month I will add more, until at the January 1st, 2019 all my thangkas will be available for free! For me this is another big leap of faith, but I am sure there will be 364 patrons out there somewhere to support Digital Thangka painting! My main project at the moment is the Mandala of the Medicine Buddha (with 53 detailed pictures, but I am also working on some other thangkas. 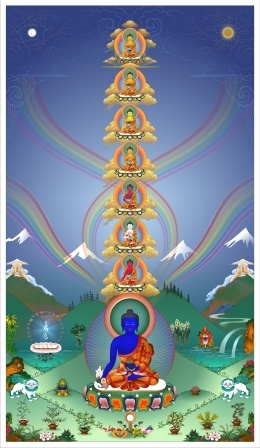 My thangkas are offered on an A1-size in high resolution (at least 300dpi); the format of the image is .jpg. do not change an image in any way, such as adding other imagery or text, crop them (meaning you cannot cut off parts of it) or change it colours. Three types of images will not be included. Firstly, some customers commission specific thangkas and want them to be kept personal. Secondly, some of the images for my indiegogo campaign Painting the Mandala of the Medicine Buddha will only be made available for my backers. Thirdly: a lot of tantric images are only meant for certain Buddhist practitioners; you can only acquire these images on request, so feel free to contact me to discuss your needs (and credentials). Don't worry though, this still leaves a massive amount of free thangka images. Supporting the creation of dharma objects creates not only good karma for this and future lifes, it is also a means to purify built-up negative karma. Your monthly gift will also help me spreading Buddhist teachings through my courses: meditation and explaining the Buddhist iconography is an integral part of my teachings. And last but not least: you set my thangkas free for everyone to enjoy and use in Buddhist practice. From 1 January 2019 onwards all my images will be free for download at my download page regardless of any goal reached. However, I need $543 per month to live from, even for the bare essentials. Your support will allow me to offer all my thangka images to the global community for free, for all to enjoy and use in Buddhist practise.